John Bleyle ’66 died on June 27, 2018, in Athens, Georgia. 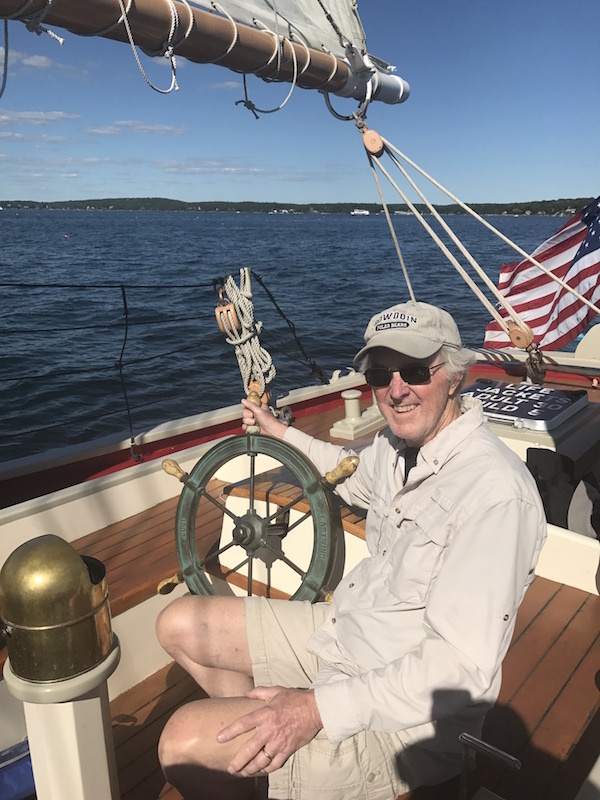 John sailing off Boothbay Harbor in 2017. On June 27, 2018, John Bleyle died at the age of seventy-three after a two-and-a-half year struggle with cancer. John will be lovingly remembered by Jean, his wife of fifty years; by their children Jody (Nina), Susan (Cliff), and Allen; by grandchildren Gilbert, Twylo, and Lucian; by his brother George; and by brothers and sisters-in-law Bill (Betty), Peggy, and Joanne (Kent). Memories of John will also be treasured by his numerous nieces, nephews, extended family, and dear friends. A native of New Jersey, John was a graduate of Bowdoin College and of Johns Hopkins University School of Advanced International Studies. In 1968, John was commissioned in the US Navy, where he completed a course in Russian and was engaged in special submarine operations with the Naval Security Group. John was guided throughout his life by a strong moral compass and a desire to help others. He was a longtime member of the Episcopal Church and became a Unitarian Universalist in Athens. He was involved in founding the PFLAG chapter of Keene, New Hampshire, and was a proud host parent to many international exchange students. He tutored GED candidates in math, was on the board of the Friends of the Athens Library, volunteered as a safe driving instructor and tax preparer for the AARP, and volunteered for Learning Ally. He also remained committed to Bowdoin College, leading the fundraising efforts for the class of 1966. A lifetime lover of sports, John grew up playing baseball from dawn to dusk and falling asleep listening to Yankees games on the radio. As he enjoyed saying, he eventually “grew out of” the Yankees and became a Red Sox fan. In Athens, he loved studying French and being part of the OLLI community. But perhaps John’s greatest joy was spending time in a little Maine cabin on the shore of Clearwater Lake, which he delighted in sharing with family-both two-legged and four-and, above all, with his grandchildren. Very sorry to hear about John. He was always an imposing presence and I had great respect for his intellect. Thank you , Cy, for your kind words.